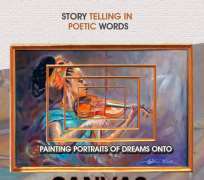 CANVAS OF REALITY is a fusion of Art, storytelling, poetry and spoken words. The beauty of art is deeper than the imagination of man: the colours and lines of COR are perfectly curved to bring rhythm to the experiences life places before us. COR is born not to prove perfection of words or flawless paintings of art but to share the reality different souls voyage through to complete the orbit of existence and to also share the values of culture, sacrifices, Love, Consistency and more.